Looking for quick and easy meal ideas for two for those busy weeknights? 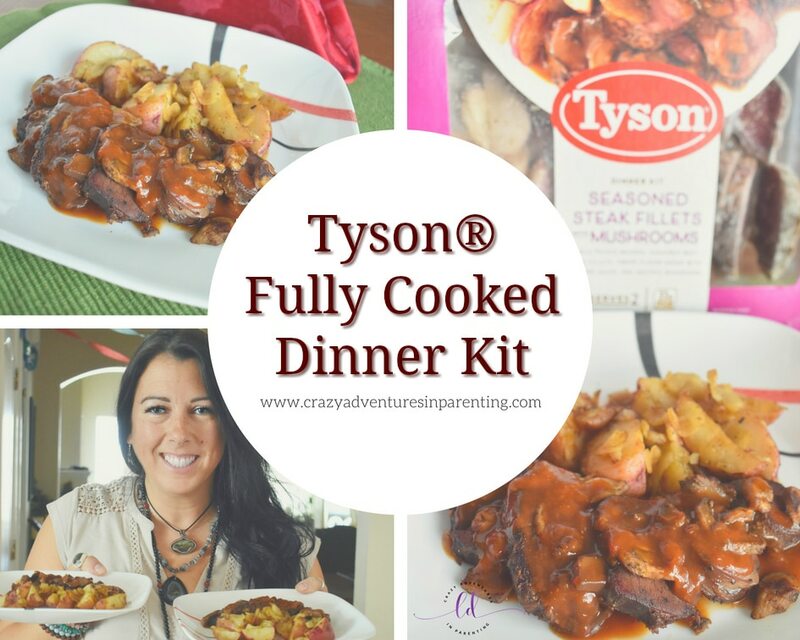 Check out Tyson® Fully Cooked Dinner and Entrée Kits! These new dinner kits are available at Albertsons in the frozen food case! Despite loving to cook, after working a full day, sometimes the last thing I want to do is cook something intricate. Sometimes, I just want to push the “easy” button and have something magical ready and smelling amazing before me. Sometimes, I just want something spectacular but uncomplicated, you know? And that’s why I am super grateful that Tyson envisioned busy people like me when they created Tyson Fully Cooked Dinner and Entrée Kits! With lots of varieties to choose from at Albertsons, we chose to try the Tyson Fully Cooked Dinner Kit – Seasoned Steak Fillet & Mushrooms. I mean, hello? I’m such a huge steak lover as it is! It literally beckoned for me on the freezer shelf! Plus, I couldn’t say no to that red wine sauce, that’s a favorite of mine in the restaurants! I wanted to see how it fared in an easy-to-prepare dinner kit at home. I’m a huge fan of Tyson products already, as their chicken is all-natural* and raised with no antibiotics ever, meaning that there’s minimal processing and no artificial ingredients added. In addition to their minimal processing, you also have convenience with these kits. Everything is perfectly portioned for you so you can get cooking and waste no time! Take a look at these contents – all ready to go right there for you! The directions are wonderfully simple, and the dish itself is an easy one. When it comes to being a busy work-at-home mom, easy is what I like to hear at the end of a long day, you know?! The high quality meat here is fully cooked and vacuum sealed into the tray for freshness! The dinner kits also include vegetables that are prepped and portioned. Easy to peel back to get started! In order to be able to sauté the fillets, you have to separate them by heating them in the microwave for 25 seconds at a time until they come apart easily. You’ll then fire up your skillet with a tablespoon of oil and warm those beautiful pieces of steak thoroughly. In another sauté pan with a lid nearby, you’ll fire up your potatoes with oil and water, covered. Once those steak fillets are finished, you set them on your plates and ready the mushrooms in the leftover steak juices with oil, mmm! And you’ll pull back the lid on the potatoes, stir a bit, and when they’re cooked through, brown ’em up a tad so that they’ll be cooked through and ready to go! While your sauté pans are rocking, throw on some music to jam out to in the kitchen while you’re cooking. Why not, y’know? Your dinner’s about to be ready with minimal effort, let’s dance!! Snip into that sauce packet, place it in a tall jar of some sort, and nuke it in the microwave until it’s thawed and hot, ready to go! Once those potatoes are beautiful, place them on your plate next to your steak fillets and top your steak with the mushrooms! G’head, you know you’re dying to finish it off with that gorgeous red wine sauce on top! Drizzle it gorgeously, you deserve it! What was I talking about earlier – magical dinner already ready? It took not even 20 minutes and you’ve got this plated and ready to eat, and it smells AMAZING! I’m ready to serve! Who’s ready to eat? I know I am! After a long day, and little effort, look at these plates! What’s awesome about these kits is that they’re meant for two, so you can easily make ’em for singles, couples, or double ’em up for the kids! With all the juggling that goes on here at home being a work-at-home mom with the kids home for the summer, or after school, this dinner kit awesomeness is just what us busy moms are looking for, you know? Check out the freezer aisle at Albertson’s stores to find these, and there are other Tyson Fully Cooked Dinner and Entrée Kits available, too! What about the Dinner Kit – Crispy Chicken Pomodoro, or Lemon Parmesan Chicken? If you’re interested in trying these fantastic Tyson Fully Cooked Dinner Kits, check out the following Albertson’s coupon – Save $2 on any ONE Tyson Fully Cooked Dinner or Entrée Kit! Check out your local Albertsons store today and pick up one of these Tyson Fully Cooked Dinner and Entrée Kits! I hope you enjoy them as we have! Bon appetit!